CLEVELAND — There is hair to be cut and money to be made, so Tony Houston opens his barbershop before the sun rises on weekends. To enter, you walk over a life-size decal of LeBron James, although just a few months ago the same image hung proudly on the barbershop’s wall. “So you can wipe your feet off,” Houston explained when asked why James’s sticker was now on the floor. If Houston had waited, he could have purchased his new floor decoration for a discount. 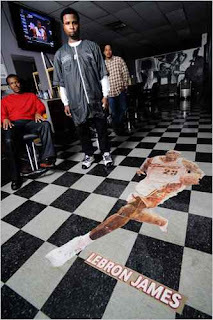 Dan Gilbert, the Cleveland Cavaliers’ owner, also owns Fathead, the company that produces decals like the one in Houston’s barbershop. It was Gilbert who also reduced the price of James’s decals to $17.41 this summer, matching the price with the year that Benedict Arnold was born. So it goes in Cleveland, where James used to play. It took only 14 words by James last July 8 — “I’m going to take my talents to South Beach and join the Miami Heat”— to shatter opinions of him in much of Ohio. He was the kid from Akron who was destined to lead nearby Cleveland to some desperately sought championships.